Drone pilot Swisslapse returned to the historic, fortified city of Dubrovnik, Croatia, armed with a DJI Phantom Pro and a plan to catch the city in it's best light. In doing so, she captured sights Game of Thrones fans will recognize from Seasons 2, 3, and 5. Watch closely for Minceta Tower, where Daenerys looked for her dragons, Fort Lovrijenac, which stood as the Red Keep, and Pile Harbour, which was the setting for both Blackwater Bay and the shores of Kings Landing. Description: One of the most beautiful places that I have ever seen: This is my homage to the amazing Croatian city Dubrovnik. 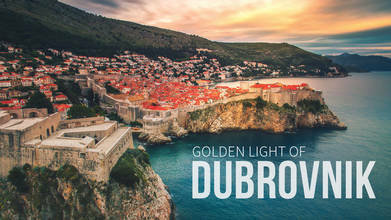 After shooting my Timelpase in 2016 I saw the beautiful golden light for the first time in Dubrovnik. One year later I decide: “let's go higher for that” and take my drone to capture the moments. The film was made entirely with only my old DJI Phantom pro and a set of ND filters. To get the cinematic feeling and look as i have used the 180-degree shutter rule, slow movement and the right time of the day. Enjoy and feel free to share.